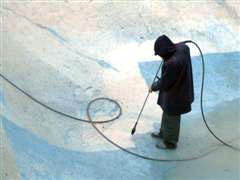 A pool that has not previously been painted with epoxy paint will need to go through a conversion process. The process that we use is water-blasting. Water-blasting gently removes most of the old existing paint without causing damage to the concrete. Any paint that is left on the pool surface is adhered well enough that it can be painted over without concern.